The Third Edge of the Sword: Did Edmonton Oilers rookie Ryan Nugent-Hopkins score a hat trick on October 15th 2011? Did Edmonton Oilers rookie Ryan Nugent-Hopkins score a hat trick on October 15th 2011? Last night the Oilers lost (surprised?) to the Canucks, 4-3. However, that score flatters the Oilers as Ryan Nugent-Hopkins (RNH to some, heretofore referred to as "The Nuge 2.0") scored all three goals, reminiscent of Doug Weight's playoff heroics in a 5-3 Oilers loss years ago. Or...did he? (The Nuge 2.0, I mean, not Doug Weight). You can watch all three goals in review on YouTube here. At the time the third goal was scored I thought it was Horcoff, the HNIC team said Hall, and the scorekeeper said The Nuge 2.0. Only one of the three of us was correct, and for once it was the CBC besting me. Please don't tell anybody. Here's the tale of the tape. For American readers I'll also include a lower-res photo with the relevent area circled in blue. 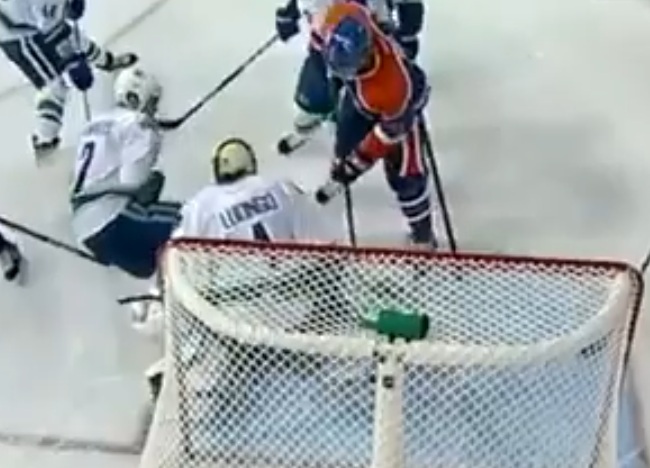 In the above photo we can see the puck rifling at high speed towards the net, where The Nuge 2.0 shot it from about 4 feet away. When you watch the video you can see the speed and the direction of the puck. 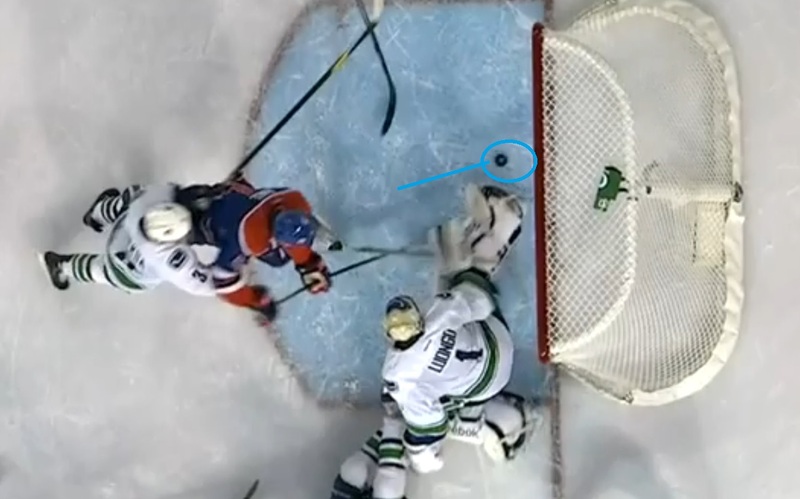 In this second shot, you can compare to the first to get a rough idea of the puck's direction, which I've marked in blue. Notice that this trajectory is likely to take it wide of the net, or at the very least far to the right side (Luongo's perspective). 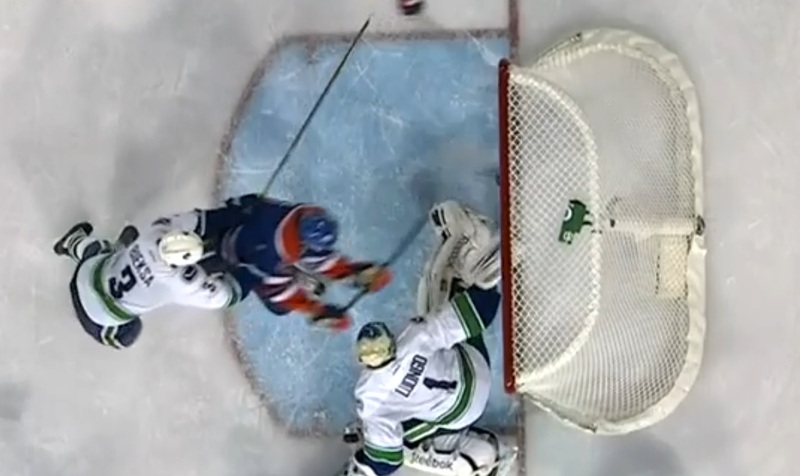 After the puck passes the plane of Luongo and Hall's sticks, its momentum changes immensely. Instead of a high speed bullet going to the right, it's not a slow flipping puck passing close by Luongo's side. Clearly, one of these two sticks has impacted the puck. I believe its Hall's, though a claim exists that it was Luongo's. From the video at this angle, Hall's seems the more likely candidate. The rough new course of the puck is shown here. 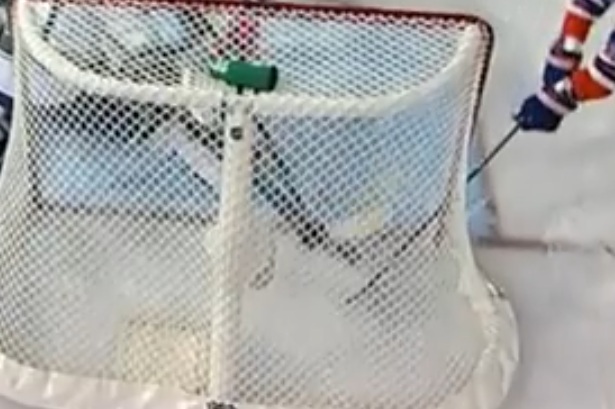 What isn't clear from photos but you can see on Youtube is how much slower the puck is going, and that its spinning end-over-end as it dribbles towards the net. 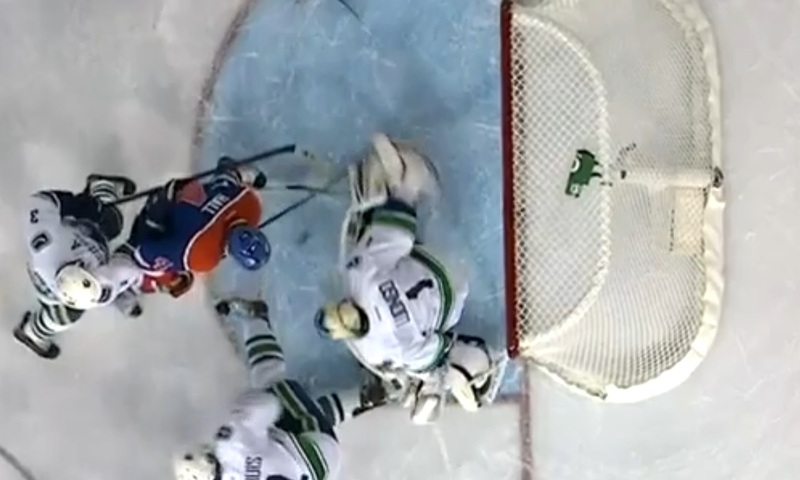 RNH's original wide shot is now headed right for the goal, but can Luongo stop it in time? The small circle here is the location of the puck, and the two larger circles are Horcoff (up top) and Hall (below) swinging their sticks towards it. Luongo's stick is moving back there as well. All three men sense there's a chance to stop that puck in time. I've circled Horcoff's stick here to show that he did not make contact with the puck, which is still near the goal line. Horc and Luongo both have their sticks behind the crease: Horcoff to bat it in (and failing), Luongo to knock it back before it clears the line. Remember that this above-the-net shot is a little deceptive: you "see" the puck pass the crossbar before it actually crosses the goal line below, despite the crossbar and the goal line lining up. This is a weird angle that Hockey Night in Canada fans have just had to mentally adjust to. 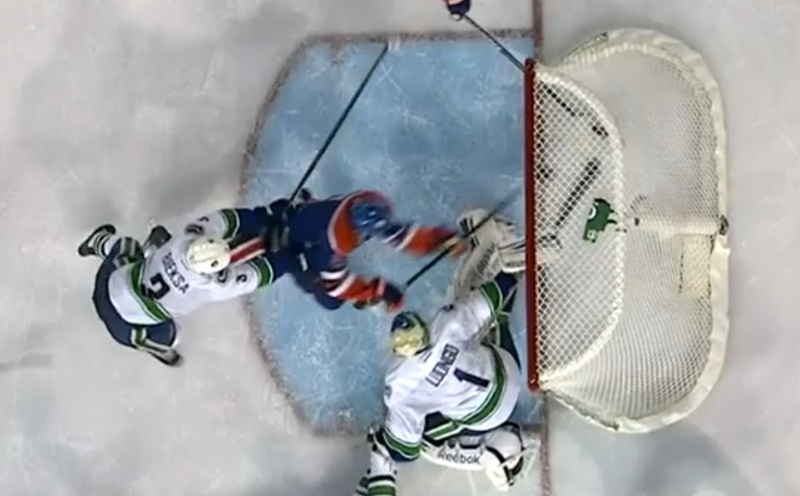 At this point my original guess was wrong: Horcoff's stick didn't touch the puck. Here's roughly the same moment as the previous photo from the different angle. 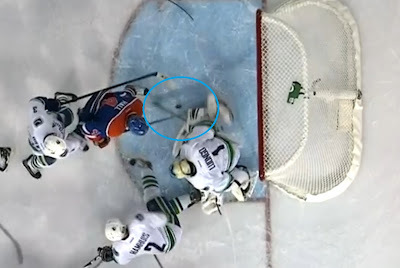 Hall's stick is about to contact the puck before Luongo, pushing it into the net. It seems fairly clear by this point that the puck has yet to cross the line. Even if Luongo was 20 feet away from the goalmouth at this point and the goal was a certainty, if Hall touches it here than its his goal, and not The Nuge 2.0. If the puck had crossed the line, then it depends who -- Luongo or Hall -- redirected the puck earlier. This is roughly the moment contact occurs. 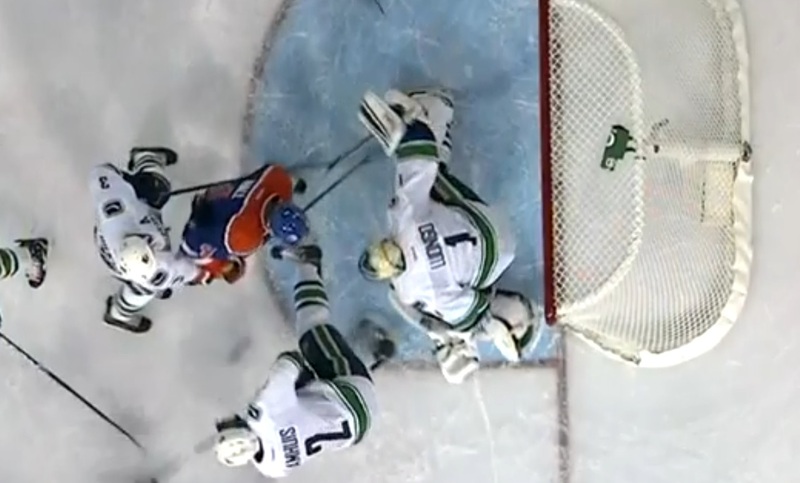 Hall gets the puck a microsecond before Luongo, but even if it was reversed Hall's angle of holding his stick gave him considerably more power, and moments later the puck is buried in the back of the net. Hall definitely pushes the puck in, and the only question is whether or not the puck has crossed the line fully. Tyler Dellow is 100% positive that it has, though I'm not convinced. 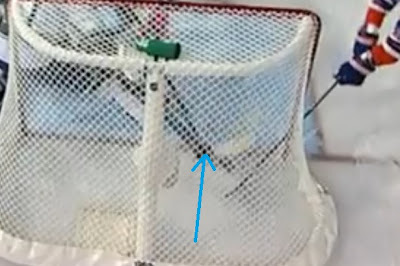 Here's that back angle showing roughly the moment where the puck (circled and hidden by the crossbar, water bottle, and webbing) changes direction. Both Hall and Luongo's stick movements could have caused the deflection, but Hall's stick is higher, corresponding better with where the puck was contacted. 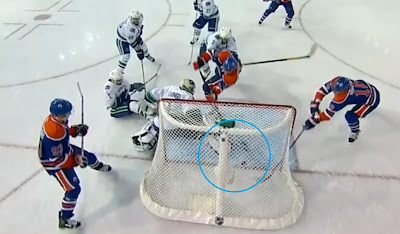 Again still pictures aren't easy, but when you watch the video it seems clear that had Luongo's stick hit the puck it would have deflected further away from Luongo rather than turn sharply right (from the puck's perspective) and head towards the net. Again, Hall touched it here. It no longer matters whether or not it crossed the goal line. The goal-scorer? Taylor Hall. The loser? Well, still the Oilers. I won't do a post about the defensive breakdowns in that game, I have neither the time nor the urge to slit my wrists.